Does Girl Scout Cookie season make you want to run for the hills (with a box of cookies under each arm)? 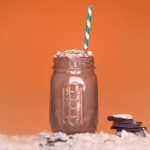 The next time you feel like caving to the siren call of those sugary treats, whip up this Vegan Chocolate Caramel Delight smoothie instead. We blended rich Chocolate Vegan Shakeology with caramel extract and toasted coconut flakes to make a smoothie that tastes like one of the most popular cookie flavors, but it’s so healthy that you can enjoy it any time without sabotaging your diet. This vegan version of the classic cookie will satisfy even the pickiest of taste buds. Place almond milk, ice, Shakeology, extract, and coconut in blender; cover. Blend until smooth. Garnish with reserved coconut if desired.